Starting Today, I plan to publish a painting and a song of S.Rajam, as a tribute to the great man on his centenary. Keep following this space daily. The first painting we share on the legend’s birthday is the painting of Swaminatha. The choice is inspired from the pallavi of the song that I would share later today, Muruganukkoru Seedan. It is well known that S.Rajam’s work were published in many Tamil magazines and art magazines such Sruti and journals such as Bhavan’s journal. Not many know that his works adorned the cover of Kannada magazine Sudha on several occasions. Here is a rare work that beautifully depicts Pranava mantra tatvopadesa by Murugan to Shiva. This picture, of course a print, and hence lacks the depth of the original painting. However, one can still appreciate the famous multi-layered coloring, the attention to details and those intricate lines. I scanned this from the personal collection of Rajam sir when I made the documentary on Rajam sir. Do not forget to notice the background design on the page of the album. Every page in his album would have a unique design , augmenting the pasted picture that he meticulously maintained in his archive. The first song that we share is “Muruganukkoru Seedan”. A composition of Harikesanallur Muthiah Bhagavathar in Kalyani. S.Rajam had the fortune of learning from many greats. The list also includes the great Muthiah Bhagavathar. Apart from learning carnatic compositions, Rajam considered it a blessing that HMB was the music director to the movie “Radha Kalyanam”, in which Rajam played the lead role. This recording is from an AIR concert. Interestingly a concert that was telecast on the day of the Kumbabishekam of Myplaore Kapaliswarar Temple. On this occasion he rendered songs on every deity in that temple complex. 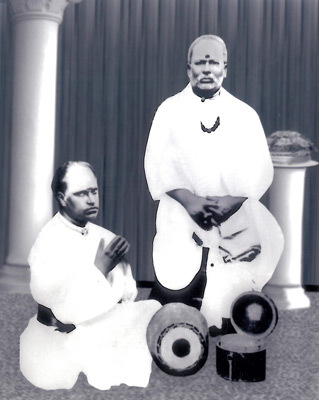 The sure footing on Shudhdha Swarams, cascading sangatis and that ‘Bigu” sangatis in the pallavi, the smallest of pauses between words that immensely enhance the enunciation and brisk/crisp nereval swarams makes one to keep getting back to this rendition.